Reason for Modification: Elara has been in several threads and learned from her master. Appearance: Often dressed in a black robe with hood, Elara's garments are simple befitting her age and rank. 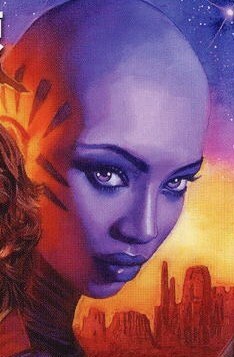 She is an initiate and traveling companion to Balaya learning from her and the One Sith. Personality: As a child Elara doesn't have much going on for herself, she is curious and timid not wanting to disappoint the giant who had her kill her mother. She functions in a slight daze at times learning what she can but feeling the effects of her masters magics. Her abilities in the force being augmented and enhanced for periods of time. One of her mannerisms is to shift back and forth on her feet while nervous. Combat Function: She is more akin to a squire then fighter. There is a shoto saber for defense and a training saber but her primary combat experience is run back to her master or to Darth Vornskr to tell him what has happened. Other Notes: Elara is an apprentice of Balaya and has a home in Kaine's castle as she does. This has afforded her a small amount of protection from the Blackblades. She has no command of them, she can't order themt o do stuff but they aren't going to let her die right away as long as she doesn't do something dumb. Her time with the sith master has let her learn from observation of her the basics of cruelty and force powers. Elara has slowly been growing colder and colder as she serves her master. Your request was fulfilled. Enjoy! Reason for Modification: Location needed to be changed due to extenuating circumstances. Modification: Ok, two categories, things I forgot and the thing I just kinda wanted changed for story and vanity's sake. Forgot: Zorrens should have canine fangs(they are dog people after all) and the nails become hard enough to cut into most woods, as it helps them climb things in an arboreal environment. Vanity's sake: Change the appearance of the high zorren tail to after the transformation... just because I really want that tail and I don't think a devthread of me ripping off someone else's should really be needed for something who's most practical use is keeping you warm with its bushy softness. All Zorrens: At some time in their lives, Zorrens are sent through a conditioning period known as the trial. A month long journey through any harsh environment will eventually start to change their body as it naturally adapts. The stress brought on by such conditions releases hormones and chemicals which speeds certain bodily functions and changes others. These changes include their nails growing into hard talons that while extended beyond the human hand are not clumsily so, ears growing a small point, hardening of their new talons to be able to cut through materials such as hard woods, canine fangs, joints on their ears to move them independently, slight changes in bone structure to allow for running on all limbs in a comfortable manner (though they remain mostly bipedal), changes in vocal cords that cause their words to come out as more of a growl, making their natural language of Veradun easier to speak, and enhanced senses. After the Trial, a Zorren’s life span also changes, causing them to age at a fraction of the rate of a normal human being while their metabolism speeds up to sustain this. A full-fledged Zorren might eat twice the normal human does on an active day. One of the largest marks of a Zorren can also be found in their bright golden eyes. High Zorrens: Much like the normal Zorrens, their body structure is the same as a human up until their trial. However, the pureblood of a high Zorren causes a special difference in that they are born with Receive a tail once they complete their transformation a canine tail. While this can be a status symbol to different groups, it is often ignored and simply seen for what it is… a tail. Darth Tsolan could you please submit in your post the sections you want edited so we can copy and paste it if accepted. Reason for Modification: Suvian has the credits to upgrade it. Modification: This submission will be completely overhauled due to the extensive amount of upgrades being done to it. Century Technological Advancement Enterprises - Prototyping Droids, Weapons and Computer Systems. Ordo your submission is in the wrong section please submit to technology submission modifications. Reform the Padawan Pack and work with jedi in disguise to corrupt and infiltrate. Personality: Elara has been hardened by her time with the sith, she still maintains a personality of carefree happiness but she knows how to be serious and stand her ground. her master's influence upon her showing her the need to find a cause and dedicate to it fully. When angered or nervous Elara now works to strike back and stop the problem, when speaking she maintains an even tone revealing very little. Combat Function: Elara through the years has grown, the time under her master has taught her several spells and force powers. Skill with a lightsaber and tri-stunner. She has begun to take a stronger role in combat able to fight with her master and coordinate with other with and blackblades. Her command of Blackblade soldiers has also improved earnign her a little respect as a student of the Sith Warlord. Other Notes: Elara is an apprentice of Balaya and has a home in Kaine's castle as she does. This has afforded her a small amount of protection from the Blackblades. She has no command of them, she can't order themt o do stuff but they aren't going to let her die right away as long as she doesn't do something dumb. Her time with the sith master has let her learn from observation of her the basics of cruelty and force powers. Elara has slowly been growing colder and colder as she serves her master. Slowly over time as she has grown in her masters service she has become a competent magic user of Dathomiri spells and working to become a sith magic user hopefully. The minor combat sklills she has held have been improving and thanks to her battle against Sophia Walsh with her master in the Second battle of Alderaan, her battle against the Havoc Squad in the first battle of Alderaan and fighting the Mandalorians on coruscant. She has become a dangerous child soldier within the One Sith. Sekirei (WIP): A prison colony world, the people of Shri-tal have created in the dangerous world a habitation zone that prisoners are kept in. Fossilized remains of cities and people buried deep underground. Kazahana Asteroid Field (WIP): On the edge of the system and filled with debris from Imperial trash dumps. The asteroids provide a small obstacle to navigate. Uzeme Nebula (WIP): Region of Ionized space surrounding the Asobi system that have helped protect it by inhibiting hyperspace travel except through marked passages. The Dragon King's Palace: The sight of an ancient and wise seer from the stars. The Duinuogwuin has been on the planet for years and offering advice to the Emperor's or Empresses even providing his blessing at their naming ceremony. The palace is tended to by members of a holy order dedicated to knowledge and wisdom but outside the jedi to prevent retaliation. Origins originate back further into the planets history but like old god they find new things. The Cloud Pavilion: A large import and export hub on the world, with traders coming from around the galaxy to exchange certain goods. Small domes are built to grow exotic plants from around and help with exotic creatures from nearby planets. The habitation domes for growing can mimic several climates including volcanic, desert, jungle, forest and snow covered. The Emperors Palace: A lavish and old style castle built with the city around it. The design is much like a wheel with the spokes roads leading to the central outer wall where the bulk of an army is housed to defend their emperor or empress. The inner wall houses homes of the highest officials and then the large castle at the center. The outer walls of the city are divided into two sections the rich farmland and upper business district area. The Pillow Book: An old tavern created in the prime of Shri-tal's modernization by Xim and the longest running establishment on the planet. The sections underneath house a guild works and base for trained assassin's and bounty hunters of the GenoHaradan. The top most sections are legit business supplying credits to the rulers of the planets. The guild and secrative nature of it allows for nearly any job to be handled or taken care of. Hammer Fall Site: An ancient temple created by the Warriors of Shadows, the Taung sisterhood that was exiled from Coruscant and fought in the Unknown regions until the incident that shattered the codex. The temple they constructed holds eight warriors and their cursed weapons. The Wicked hammers that have created a nexus within the force. Ancient Ruin: Carbon dated to pre republic times and containing murals of beings coming from the sky to wipe out technological advancement to a level they deem acceptable. The remains of a broken hypergate are at the center but not as old as the ruins themselves. The only sign of connections is the Ophidian Grotesques an ancient statue found on Coruscant. The statues point to things older and pre-date most Republic records but are not from Kwa, Gree, Rakatan origins. Shri-Tal Companions Temple: Built in an ancient Atrisian style temple for the Companions guild. It is within the mountains and protected by the Ranger's who protect the world. Danger has bought the land and provides credits for the Silver jedi and planets coffers for their privacy. Aoi Estate: The Silver jedis base of operations on the planet, a two story building created on the lake with a shrine and plenty of space for them. The exterior is elaborate looking like the other rich estates in the area but the interior is sparse with a home for their head researcher below and lower then that a vault. Reason for Modification: Found an image that would seem really useful when referring to the Gladius' VIS/HUD feature of the armor and thus allows for an easier construction of roleplaying posts. Modification: The addition of this picture below the actual submission photo with the caption of: The VIS/HUD system as seen from the user. This is done, but I'm going to need an image source for the new picture. So what exactly do you want me to do? Apologies for the delay, this has been done. Long after the fall of the Sith Empire, a raiding force led by Ashin Varanin, Spencer Jacobs and Jared Ovmar reclaimed and removed the station and heavily damaged the moons' defenses. Thanatos Station is no longer located in the Styx system. In the modern era, Echidna reaped the harvest of Danger Arceneau's bounty against assets of Subach-Innes Corporation. In hopes of changing the Yuuzhan Vong world's climate and making the Subach factories untenable, a team of Mandalorians led by Ember Rekali, Jasper Ordo and Skye Mertaal removed the station with a quintet of synchronized bulk freighter hyperdrives. Khar'lan Station is no longer located in the Echidna system. It is not yet known what long-term effects the station's absence will have on Echidna, but seasons and weather patterns are out of kilter. I had wondered about that. Will change. Link to Submission: Because y'all lazy. Reason for Modification: Sentence fragment. I had a couple of typos when I submitted this that I hadn't proofread out when it was locked. Modification: The Heart of Clamor description should be finished out something like this: "This roiling boil on the face of the world defies most expectations of geothermal science, and the only explanation is that the warped nature of the planet sustains such an impossible peak." I've learned my lesson. Next time I'll actually give it a once-over before submitting it.